Purple flower buds top a tall, swaying stem and tiny urn-shaped yellow/white/purple flowers gradually unfold. The stem continues to elongate with a bud blossoming into a flower every few days depending on the moisture and temperature. 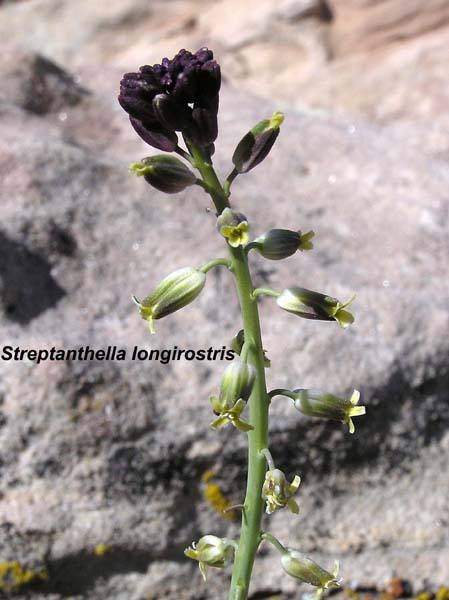 Growing in the open, Streptanthella longirostris tends to be compact, straight, and about 12-18 inches tall. Starting life under a rock or in the shade of Pinus edulis forces the plant to stretch for sunlight in an open, elongated, crooked, staggering growth pattern up to three feet tall. Streptanthella longirostris' beak-like tips of its numerous, drooping seeds gives rise to its species name: "longirostris" is Latin for "long beak".